Sitting: Phyllis Jenkins, Lauranne Sams, Betty Smith Williams and Ethelrine Shaw. Mattiedna K. Johnson, Phyllis Davis, Mattie Watkins, and Florrie Jefferson. 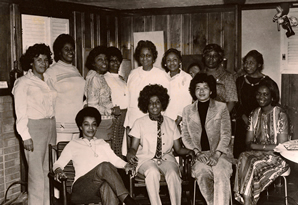 THE NATIONAL BLACK NURSES ASSOCIATION, INC. was organized in 1971 under the leadership of Dr. Lauranne Sams, former Dean and Professor of Nursing, School of Nursing, Tuskegee University, Tuskegee, Alabama. NBNA is a non-profit organization incorporated on September 2, 1972 in the state of Ohio. NBNA represents approximately 200,000 African American nurses from the USA, Canada, Eastern Caribbean and Africa, with 115 chartered chapters nationwide. NBNA mission is to provide a forum for collective action by African American nurses to represent and provide a forum for black nurses to advocate for and implement strategies to ensure access to the highest quality of healthcare for persons of color. NBNA collaborates with private and public agencies/organizations that share common concerns for improving the health status of all people, particularly African Americans and other minority consumers. NBNA publishes its Newsletter four times a year: Spring, Summer, Fall, and Winter; and a Journal of NBNA twice a year: Spring/Summer and Fall/Winter. NBNA convenes an Annual National Institute and Conference. The National Black Nurses Association hosts an Annual Institute and Conference in the summer of each year. NBNA's Annual Institute and Conference features the most prominent speakers in nursing and health care.